In the 40 years since China began opening its doors to more market-oriented economic policies, the country has experienced explosive growth that many refer to as nothing short of a miracle. The nation’s growing influence has been felt on every continent, and people have taken note that China continues to play an ever-larger role in world affairs. But more power brings more expectations and accountability, and in our most recent survey many people around the globe say they want an alternative to China as the world’s leading power. 1Globally, people differ in how positively or negatively they view China. Across the 25 countries polled in a recent Pew Research Center survey, a median of 45% have a favorable view of China, while 43% hold an unfavorable view. Majorities or pluralities in 12 countries give China positive marks, with favorable attitudes most prevalent in Africa, the Middle East and parts of Asia. In the United States, 38% have a favorable opinion of China, a slight decrease from 44% in 2017, while nearly half expressed unfavorable attitudes. 2 A global median of 70% say China plays a more important role in the world than it did 10 years ago. Russia is a distant second in this assessment, with only 42% saying that country is more important than it was a decade ago. 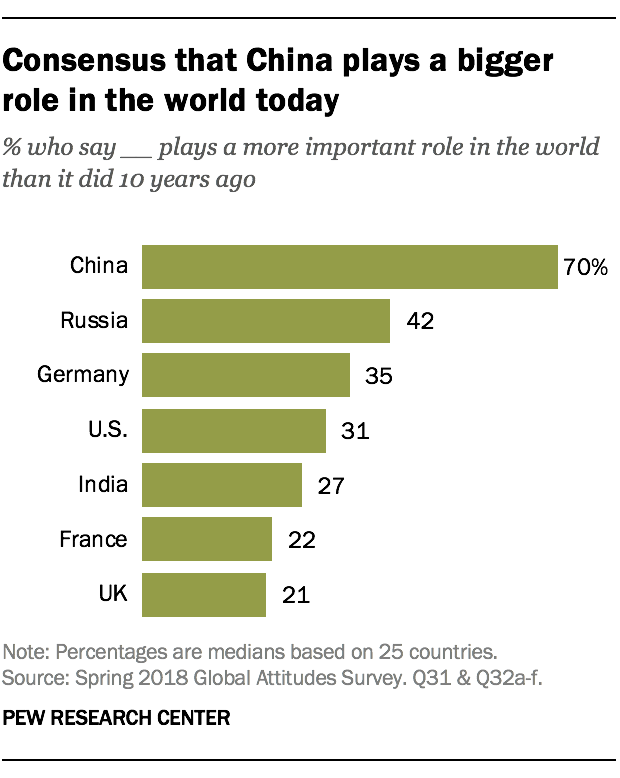 A median of only 31% believe the U.S. plays a more important role than it did a decade ago – less than half of the share who say this of China. Only 8% of those surveyed say China plays a less important role than it did a decade ago, the lowest share across the seven countries tested. In the U.S., 72% believe China is more important now than it was a decade ago, while only 31% of Americans say the same about their own country. 3 While most agree that China’s global role has grown over the past decade, a lack of enthusiasm for Chinese world leadership persists. A median of 34% of people around the world currently regard China as the world’s leading economic power – only slightly less than the 39% who picked the U.S. Yet when thinking about the future, a 25-country median of 63% say they prefer a world in which the U.S. is the leading power, while just 19% would favor one in which China leads. Notably, four of the five countries most inclined to choose the U.S. over China are located in the Asia-Pacific region: 81% of Japanese, 77% of Filipinos, 73% of South Koreans and 72% of Australians all favor a future where Washington, not Beijing, leads. 4 There is a general lack of confidence in Chinese President Xi Jinping. A median of 34% across the countries surveyed voice confidence in Xi, while 56% lack confidence in him. This puts him slightly ahead of Russian President Vladimir Putin (30%) and U.S. President Donald Trump (27%) in international confidence ratings, but behind German Chancellor Angela Merkel and French President Emmanuel Macron. Xi’s strongest backers are in the Philippines (58%), Kenya, Nigeria and Tunisia (all 53%), and Russia (50%). Confidence in Xi is particularly low in Europe. Just 9% of Poles and 11% of Greeks trust him. Confidence in Xi in the three sub-Saharan African nations surveyed is higher than in any European country polled. Half of Americans lack confidence in the Chinese leader. 5A median of 66% across 25 countries say the Chinese government does not respect the personal freedoms of its people, compared with 19% who think it does. Those who are more likely to say that China does not respect the personal freedoms of its people also tend to have more unfavorable views of China (e.g. France, Sweden). Conversely, people who are less disapproving of China’s human rights record show lower unfavorable opinions of China overall (Nigeria, Kenya, Tunisia). European nations surveyed tend to be particularly critical – a median of 82% across the 10 EU countries surveyed say China does not respect personal freedoms. Among countries at the more negative end of the scale, Japan is the outlier, showing higher levels of general dissatisfaction with China that may relate to historical and political strains in bilateral relations. Correction (Jan. 4, 2019): Item No. 2 of this post and its accompanying chart have been corrected to reflect a revised weight for Australia in 2018. The revised 25-country median viewing Russia as more important compared with 10 years ago is 42%.